Have you ever felt lost in the city? Is it sometimes challenging to understand what urban planners are trying to achieve? Could emerging technologies improve public participation and make cities more liveable? Interpreting complex urban planning strategies can be difficult, let alone far-reaching future scenarios. In Augmented Urbans, we believe that better visualization with rapidly evolving extended reality (XR; augmented, virtual and mixed reality) technologies can make it all easier and more understandable. Extending Design Realities delves into this topical intersection of XR technologies and contemporary urban planning. We explore how new technologies can assist urban planners in making public participation better for all parties involved – and how to design more resilient cities to tackle the increasingly complex challenges they face today and in the future. 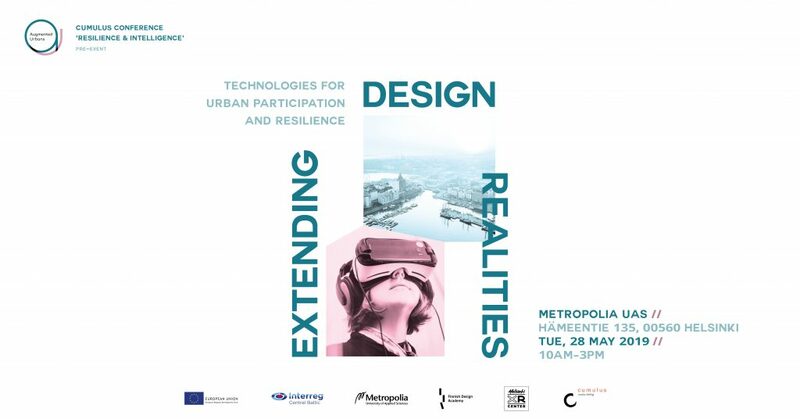 Join us in discussions and networking, hear leading experts from XR and urban planning fields share their insightful and inspiring perspectives in keynotes, and experience fascinating XR solutions yourself in the newly established Helsinki XR Center! Details regarding the speakers and event schedule will be announced later in this event. Save the date now and make sure you get one of the limited seats by registering in Eventbrite today! Extending Design Realities is a pre-event for Cumulus conference 2019 in Rovaniemi ‘Around the Campfire: Resilience and Intelligence’. Augmented Urbans (AU) co-develops integrated urban planning practices and more meaningful participation through Extended Reality (XR = VR/AR/MR) technologies. Co-funded by the Central Baltic Interreg and coordinated by Metropolia UAS, AU involves 4 countries, 5 pilot cities, and 10 partners. Finnish Design Academy (FDA) develops Finnish design education by building a new kind of collaboration model that aims to strengthen the role of university-level design education in the Finnish innovation ecosystem. FDA is a collaboration between Finnish university-level design schools and Ornamo Art and Design Finland.